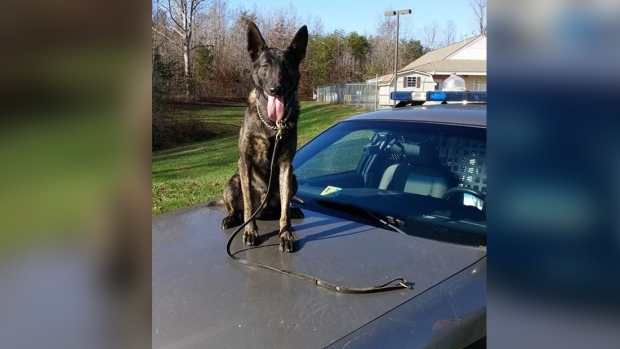 A sheriff’s office in Virginia is touting the benefits of having police dogs in the unit after a K9 found two missing children in less than 15 minutes of searching. In a Facebook post on Sunday, the Powhatan Sheriff’s Office said an eight-year-old boy and an eight-year-old girl went missing just before dusk the day before. Deputy Quinn Pasi with the sheriff’s office said the children were scared while they were playing in the woods with one of the children’s older siblings. 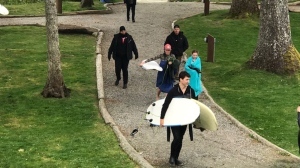 “They took off further into woods and then got disoriented and turned around and they couldn’t figure out how to get back,” he told CTVNews.ca in a telephone interview on Tuesday. After parents and neighbours scoured the nearby woods for 45 minutes, Pasi said the girl’s mother called police at approximately 6:30 p.m.
After searching the house where the children were staying, Pasi and his Dutch Shepherd K9 named Bane went into the woods to track the missing boy and girl. Pasi said Bane wasn’t tracking the children in particular, but was just searching for any person in the woods. “Within 15 minutes of K-9 Bane entering the woods he was able to track and locate the children,” police said in the Facebook post. The deputy said he wasn’t surprised by how quickly his dog located the missing children. “He is a very efficient dog. It was just more relief to be done and to have them back,” he said. The sheriff’s office used the story as an example of why it maintains its “expensive” and “very time-consuming” K9 program when other agencies of a similar size do not. “You get reminded why you have to have it and this is one of those situations,” Pasi said. It appears Bane has a strong work ethic too, as described by the sheriff’s office.